Please visit our canine-assisted swimming page for lots more info, photos and videos. If you would like a flyer that is higher resolution, just go to our contact us page and let us know. ​​Puppy Prodigies has been providing canine-assisted programs since 2006. We are a grassroots organization that prides itself on our pioneering efforts and innovative programs utilizing highly trained service dogs, therapy dogs and emotional support dogs. 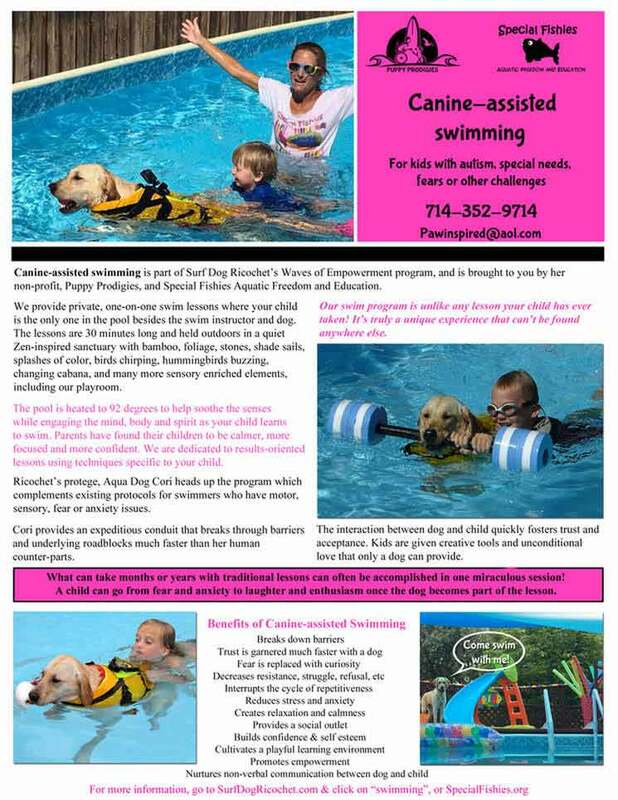 The objective of the canine-assisted swim program is to help kids learn about water safety-- and how to swim, which will ultimately save lives. Drowning, although preventable, is the leading cause of death for children ages one to four, and the third leading cause of death in children 19 and under. ​​However, the danger of drowning is much higher for children with special needs. In fact, drowning is the leading cause of death for kids with autism. It is because of these statistics that our program is critical, especially for families whose children haven’t learned to swim due to a disconnect, or lack of trust between the instructor and student.